Let’s talk about the free hand system! The free hand system (often abbreviated to FHS) is a feature available on most BERNINA machines. 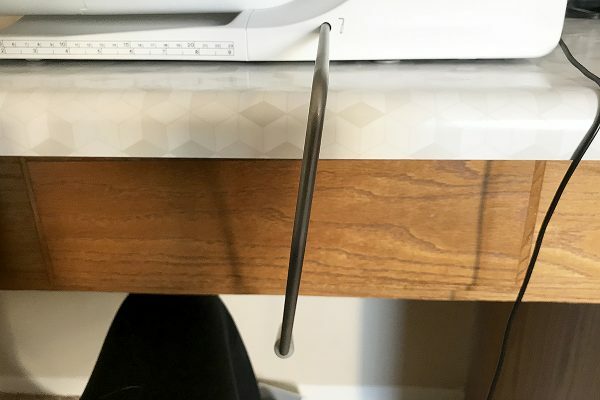 The FHS is a bar that locks in on the lower right side on the front of your sewing machine. With just the nudge of your knee, you can raise and lower your presser foot. This helps you retain better control of your sewing project because you never have to take your hands away from the fabric to move your presser foot! With practice, using the FHS can help your sewing projects progress up to 20% faster. 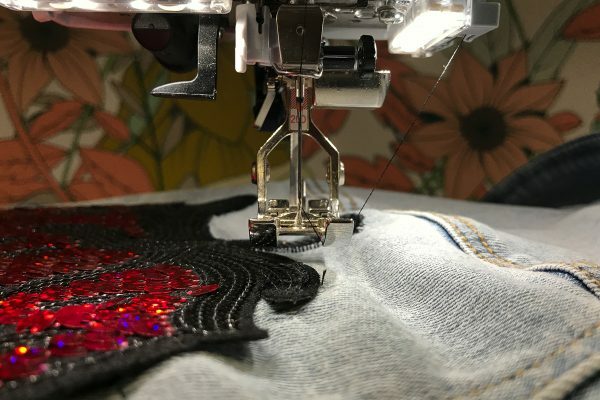 The FHS is really life-changing when you’re working around curves and points in applique, pivoting corners, or are working with any shape that’s not a clean straight line. Being able to keep your hands in contact with the fabric helps keep you in total control of your stitching. While bringing the presser foot up and down is great and useful to have hands-free, there’s more happening when you use the FHS than you realize. When the presser foot is raised using the FHS, the feed dogs on your machine drop which has two great benefits. One is that more space is created between the bottom of the foot and the stitch plate. This also reduces the chance of delicate fabrics like silks and satin weaves from snagging on the texture of your feed dogs as you slide them under the needle. First off, you need to plug the FHS into your machine! Insert the metal bar into the opening at the lower edge on the front of your machine. On the B 350 or a 5 Series machine, this is all the way in the lower right corner but on a 7 Series machine or a B 800 it’ll be closer to the free arm. Use your knee to push the FHS to the right. This will lower your presser foot to the fabric, allowing you to keep your hands on the project. This is handy for all your sewing but particularly useful if you’re sewing bulky and heavy items or something delicate and slippery! Sometimes you need both hands to control what’s going through your machine. If you’re in the middle of a seam and need to readjust or are pivoting around a corner, you can nudge your knee to the right and bring your presser foot up. The further to the right you push, the higher your foot will raise. When pushed all the way to the right, the presser foot will actually lift higher than its standard raised position which is great for particularly bulky seams! Just be sure that your machine is set to stop with the needle down. By simply releasing pressure from the FHS, the presser foot will return back down to the fabric and you can resume stitching! 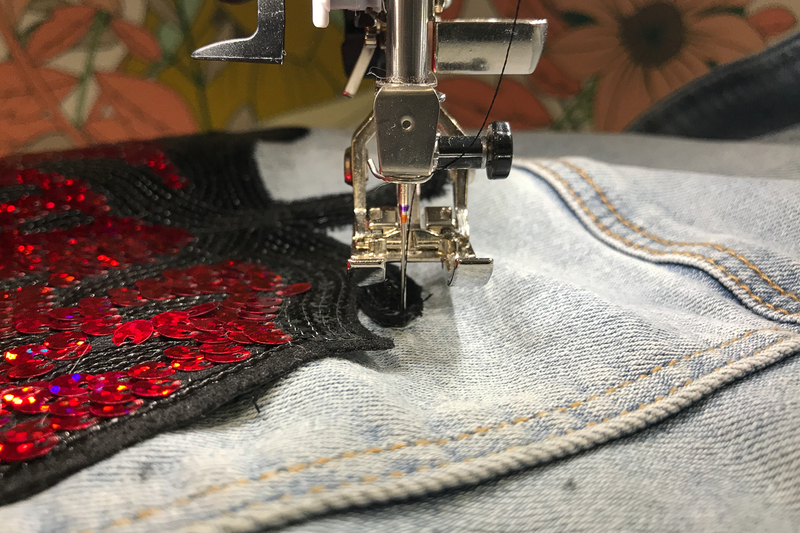 It may take a project or two to get comfortable with using the Free Hand System throughout your sewing but once you make a habit of it, it’s impossible to live without! I love the knee lift….however, on my Bernina (640), the knee-lift always works loose from the machine while I’m sewing. I constantly need to push it back in. 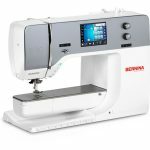 There are no Bernina dealers anywhere near where I live, and my local sewing-machine man had no idea whether it could be fixed. Is there any way to make the knee-lift lever stay firmly in my machine? I was having a problem with my FHS staying in also. I have an B880 so I asked my Bernina guy to adjust the lift point. He did that and then told me on the earlier models the FHS would slip out but they now have a click-in system on the newer models. I didn’t know that, so I tried it and the FHS clicked in and haven’t had a problem since. I love my FHS on my Bernina 135 & my 351. To make it even easier to sew, I re-learned sewing on my sewing machine by using my left foot on the pedal. This frees up my right knee for the FHS. It took some time to get left-footed but well worth the transition! I was told about that hint but tried it and it just didn’t work for me. I would lots rather have a knee lever for the speed control, rather than a foot pedal that slides all over the place. I hate the knee lift and went into settings and chose “Hover with needle down”. I am a previous Viking owner and I loved the fact that when I took my foot off the foot pedal my sewing feet would lift up and I could move my material or whatever. The “Hover with needle down” works as well but there is a delay when there was no delay with the Viking. So for you haters of the knee lift try the “Hover with needle down”. I wondered why we weren’t taught this in the “New Owners Class”. I was surprised to see that you deleted out my comment and I was wondering why. I didn’t think there was any thing wrong in telling people a different method to use if they don’t like the Hands Free System. Both are on the Bernina’s so why not tell people there is another method to free your hands. I love the knee lift and have used it so many years on all my Berninas. I also use my right foot. My knee lift was adjusted as I am short, so I can do both at the same time. Having both hands free is a wonderful allay in creating good corners and speeding up one’s sewing. 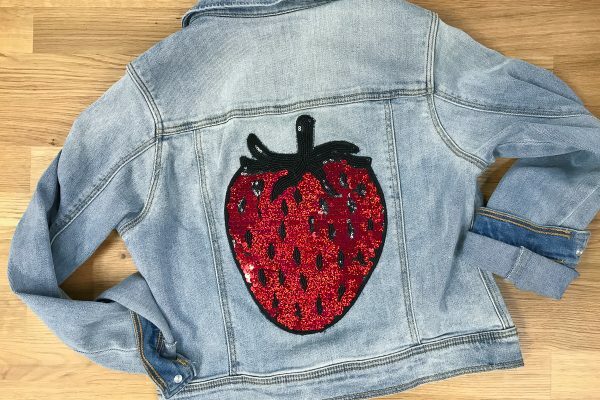 I sewed on another machine at a conference and it drove me crazy to have to stop and put my hand up to sew! Spoiled by Bernina! I didn’t know about it being able to be adjusted either. But I was frustrated with it coming out from vibrations too. I use a sew steady on mine most of the time so came up with this idea. 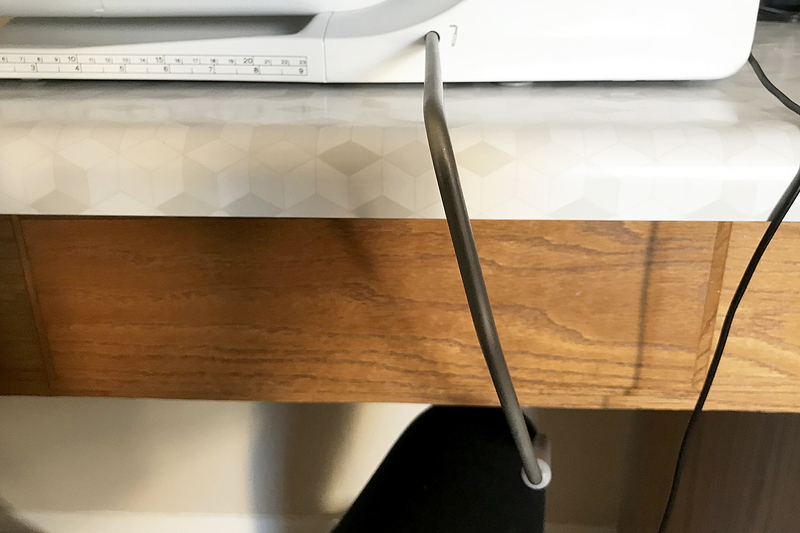 I used a 3/4″ wide non-roll elastic and made a loop to slip over the sew steady table leg nearest the FHS. Then sewed Velcro to the other end to adjust fit. I wrap it around the flat end facing further away from the machine, adjust as needed. Problem solved! It has never loosened since. Is not permanent so no damage. A quick fix for those not near a dealer or not wanting to pay for the adjustment. If you don’t use a sew steady table attachment, this could probably be modified to attach a screw on the underneath side of your sewing table. Then attach a thinner loop to your elastic & slip it over the partially driven in screw underneath. That way you could use either method. I only use that sew steady table for quilting & find that the regular sewing table underneath vibrates mostly when I do that. Regular sewing doesn’t seem to make it vibrate so much so I usually don’t need it. Hope this helps some people, happy sewing! LOVE MY BERNINA 770QE! I love the knee lift, however after using it for about 15 min my machine locks up with a birds nest on back of quilt. When I untangle thread in bobbin area there are several small pieces of cut threads. I am being really careful and sit far enough away so my knee doesn’t accidentally move it. Do you know why this could be happening? I have 830 series. Oh no! That’s no good. Generally speaking, an issue like that may be related to the FHS but not directly caused by it– it sounds like a problem with your tension discs. Sometimes thread can get caught there and cause mysterious problems. It’s difficult to diagnose exactly what’s going on over the internet, or without really seeing it, so I suggest taking it to your local BERNINA dealer to inspect! I love the FHS (Knee Lift). I have used it on my old #1130, #1260, #350 and my “Bernie” #B790. It has come in handy many times. I would not buy a machine that does not have a knee lift. I have never had a problem with the FHS on any of my machines. I love the FHS. I have been using it since I bought my 1630 in 1996.I have just bought a 830 and I am having to get used to its FHS as it seems a bit larger?? But perseverance is key! How very quickly I came to depend on the FHS! I put it on because I had some applique to do. That did it! Now, if I don’t have it attached I need to stop and get it put on! It’s very convenient and quick. I use it for piecing as it allows me to drop the presser foot with accuracy. This is my first Bernina and I love the FHS. It took some time to remember to use it and how to use it effectively, but it really adds to my sewing enjoyment. I like not having to take my hands off tricky fabrics.